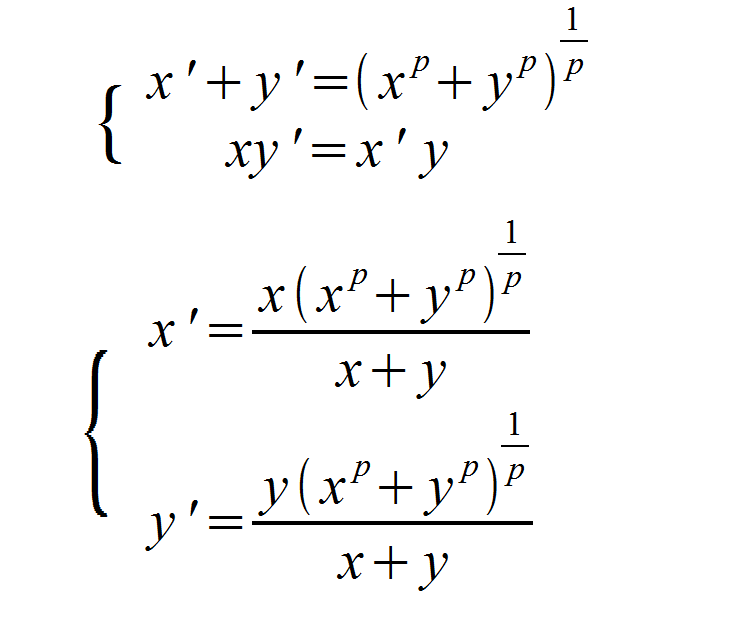 , where v=(x, y) is the original point and v'=(x', y') is the transformed point. 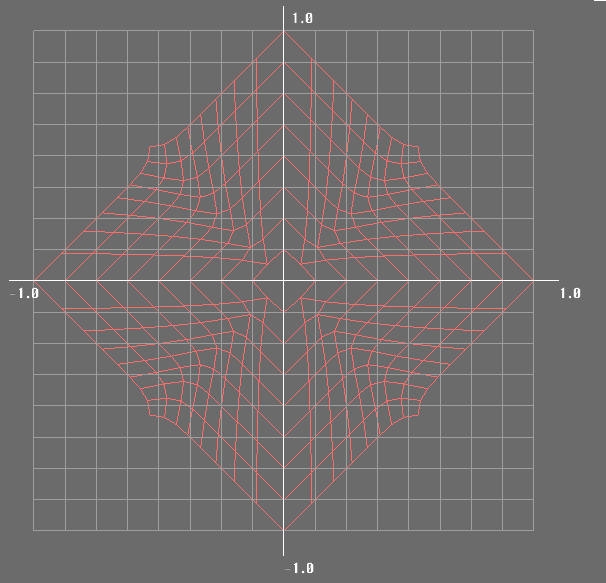 Although the function cannot transformed the points into a perfect rhombus, it does not have too much artifact when used for animation blending. In this post, I have described how to map points inside a unit square to a "rhombus" which used for animation blending. But the problem is not completely solved as I am not taking the limit of p to infinity, and there are some power function in the transformation which is not fast... 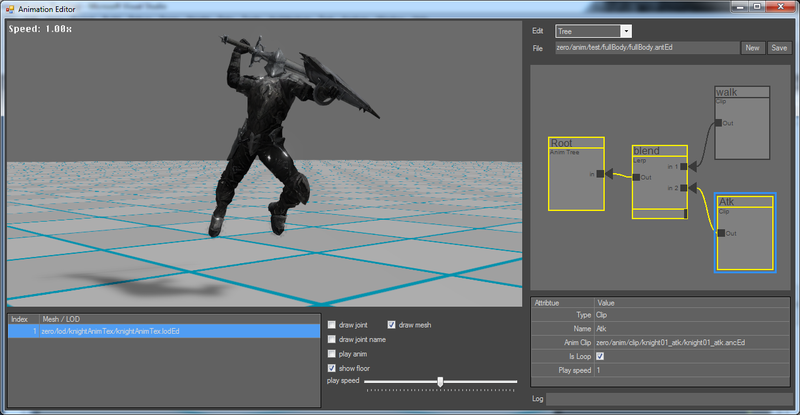 But this is enough for calculating the blend weight of the animations. It has been a long time since my last post. I was busy in the past months, and finally have time to finish dual-quaternion skinning and added some basic animation to my code base. 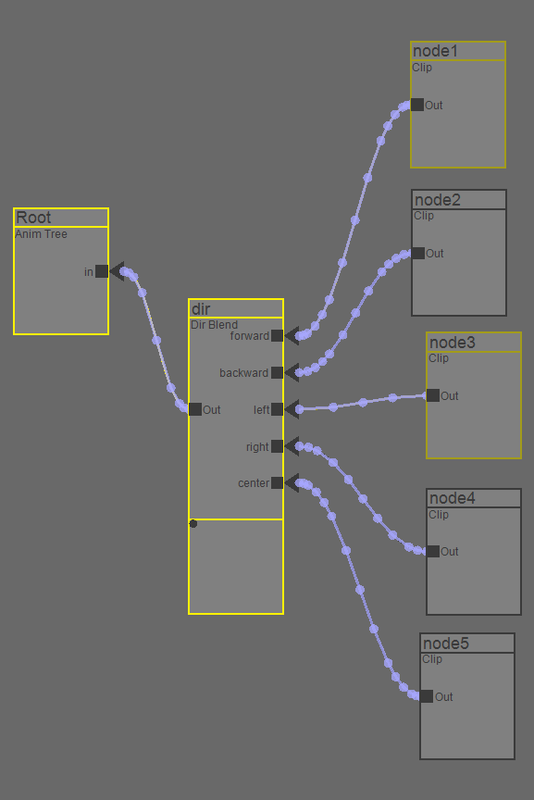 In the animation tree editor, those tree nodes can be connected/disconnected, which displayed by a cubic Bezier curve. 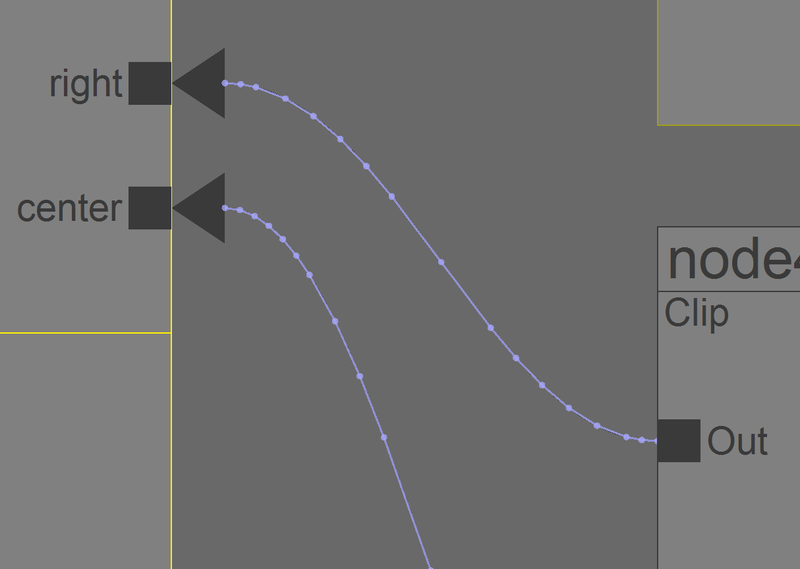 I want the user can right click the curve to disconnect the tree nodes, so checking whether a point lies on a Bezier curve is need. 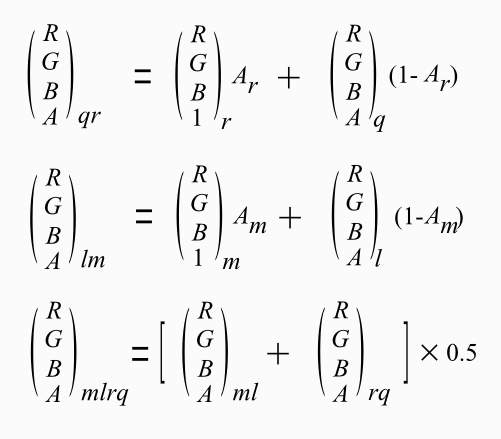 solving an analytical solution for this is quite complicated. So I just sub-divide the curve into several line segments and stop the sub-division if the points are close to a straight line. After that we can check if the point is lying on the line segments instead. First we start at the 2 end points of Bezier curve and check whether the mid-point(the red cross) need to be sub-divided. 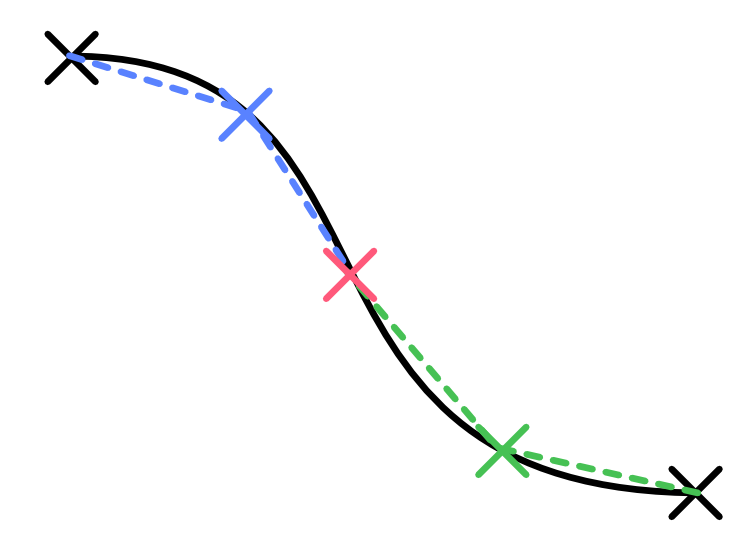 We can't simply check whether this 3 points close to a straight line because there may have an inflection point on the curve, so we need to look ahead 1 step further to see whether the 2 line segments(the blue and green lines below) are a straight line, if not, then the red point need to be sub-divided. 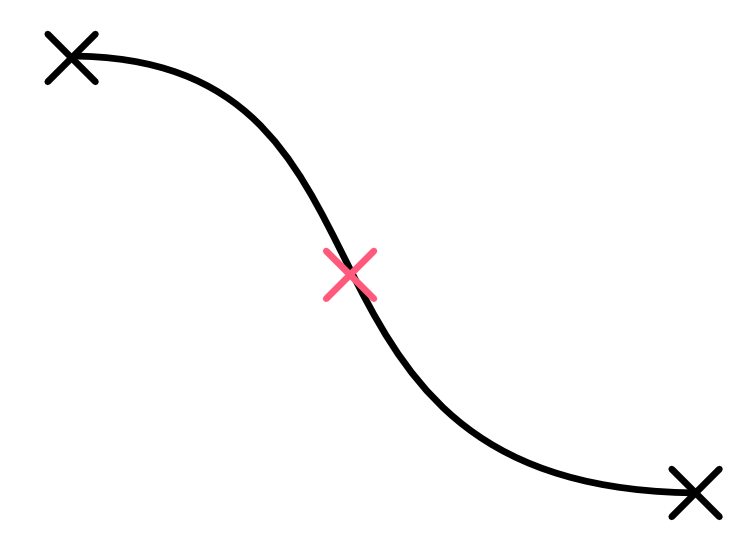 This short post describe a way for checking whether a point is on a cubic bezier curve by using line sub-division. 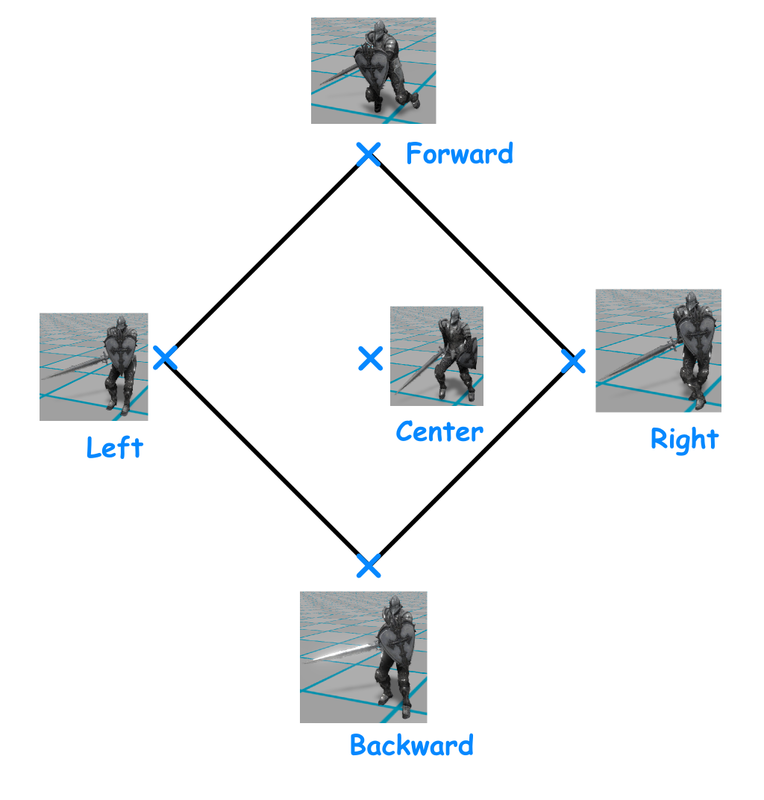 In the next post, I will talk about another fun stuff when writing the animation editor. 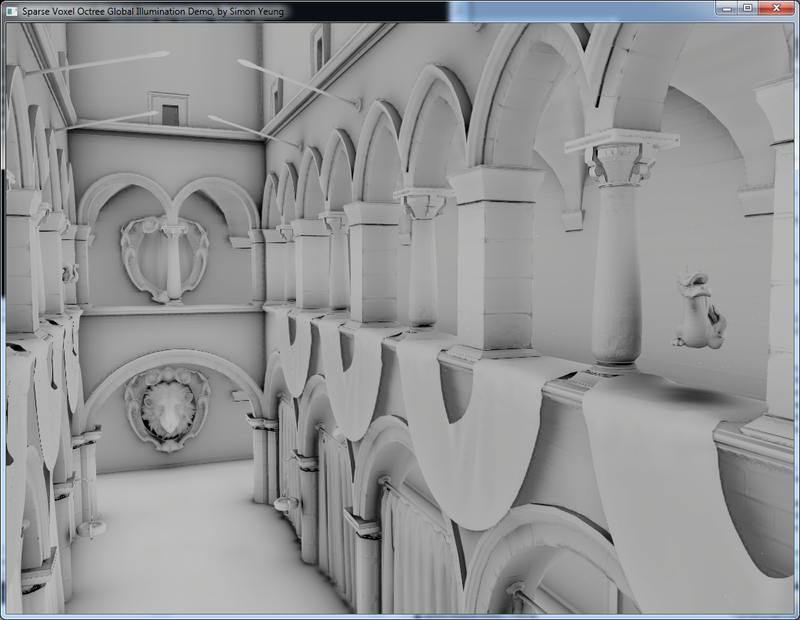 In last year SIGGRAPH, Epic games presented their real time GI solution which based on voxel cone tracing. 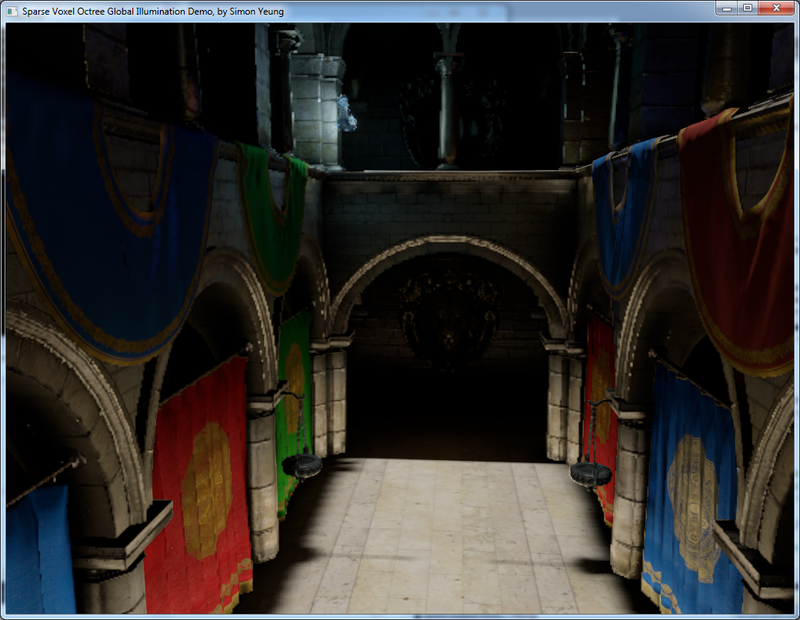 They showed some nice results which attract me to implement the technique and my implementation runs at around 22~30fps (updated every frame) at 1024x768 screen resolution using a 256x256x256 voxel volume on my GTX460 graphic card. 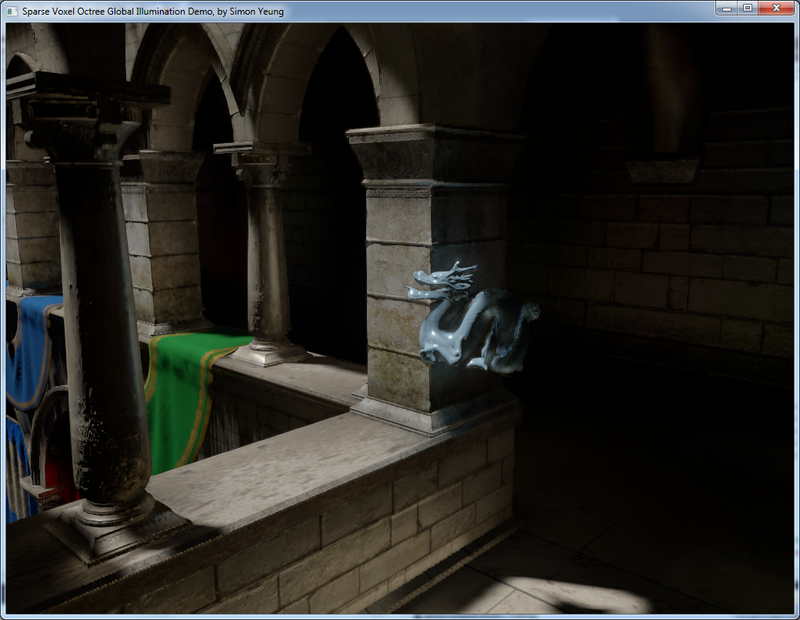 The demo program can be downloaded here which requires a DX11 GPU to run. The step 1 and 2 can be done only once for static geometry while step 3 to 5 need to be done every frame. The following sections will briefly describe the above steps, you may want to take a look at the original paper first as some of the details will not be repeated in the following sections. The first 4 bytes store the position of that voxel inside the voxel volume which is at most 512, so 4 bytes is enough to store the XYZ coordinates. 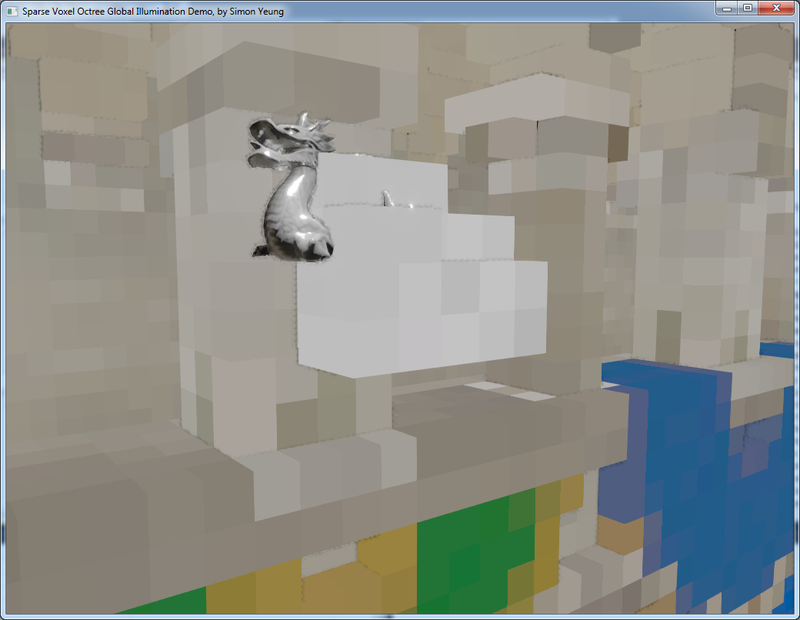 Voxel fragments are created using the conservative rasterization described in this OpenGL Insights charter which requires only 1 geometry pass by enlarging the triangle a bit using the geometry shader. 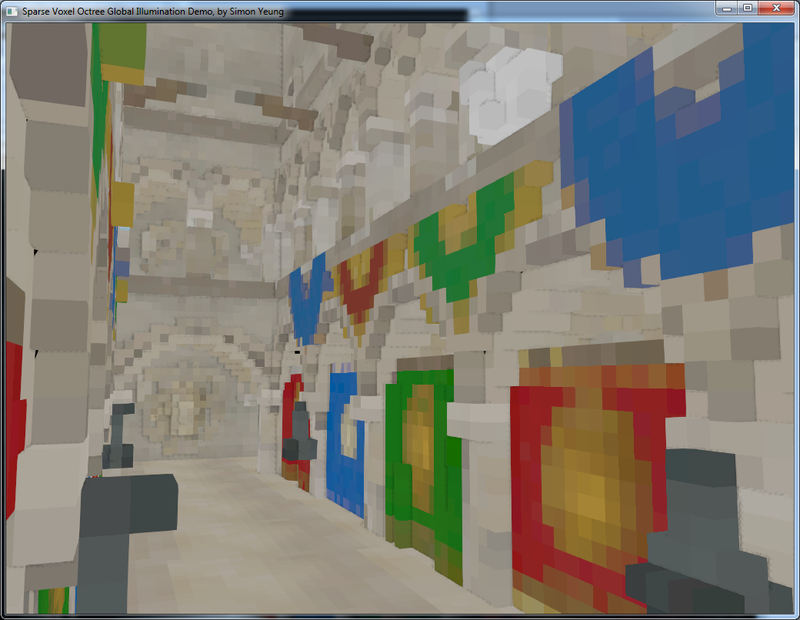 So I modify my shader generator to generate the shaders for creating voxel fragments based on the material. I use a similar data structure that described in the voxel cone tracing paper and giga voxel paper with a large octree node buffer storing the octree/voxel node data (with 8 node grouped into 1 tile which described in the paper) and a 3D texture storing the reflected radiance and alpha from the direct lighting at that voxel (I assume all the surface reflect light diffusely so only 1 3D texture is used which is different from the paper storing incoming radiance). The child node tile index is also used to index the 3D texture brick(more details can be found in voxel cone tracing paper about the texture brick) which store the reflected radiance of that octree node tile. And since I use 5 bits for store different bit flags for dynamic update, so my voxel volume can only be at most 512x512x512 large. 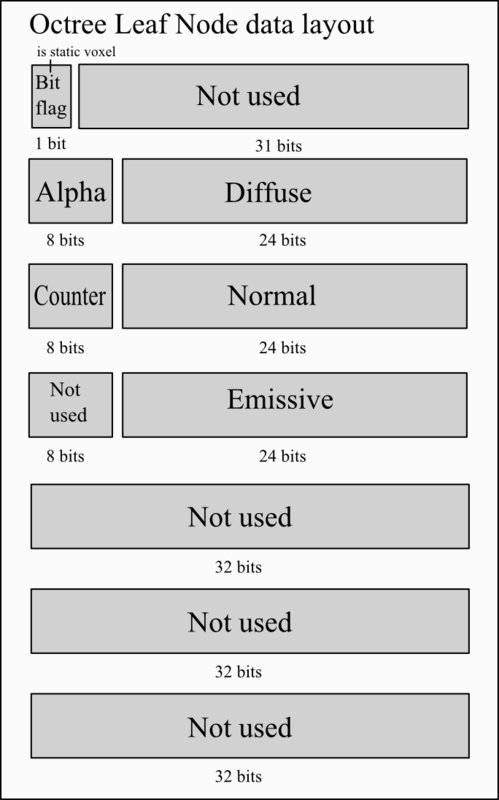 the first 4 bytes store the bit flag to indicate whether that voxel is created from static mesh so that it will not be overwrite by dynamic geometry. 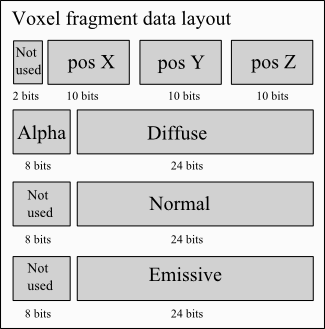 Also the 1 byte counter stored along with the voxel normal is used to perform averaging when different voxel fragments fall into the same voxel. 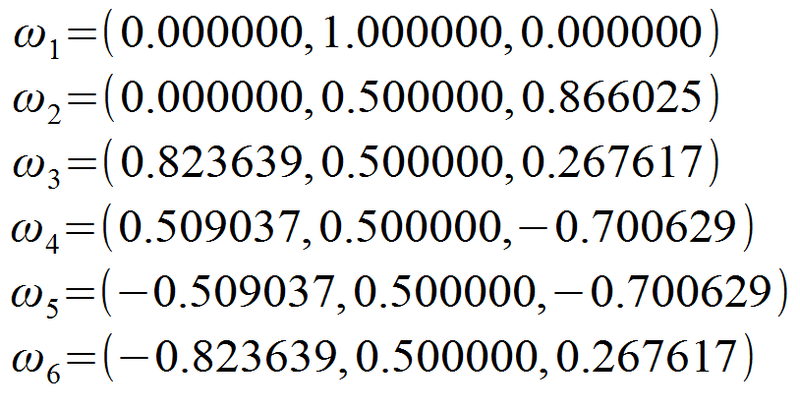 The steps to perform atomic average can be found in the OpenGL Insight Chapter. So given the voxel fragment queue output from the previous steps, we can build the octree using the steps described in OpenGL Insights Chapter and average the octree leaf node values when different voxels fall into the same node. After building the voxelized scene, we need to add the lighting data into the data structure to calculate global illumination. 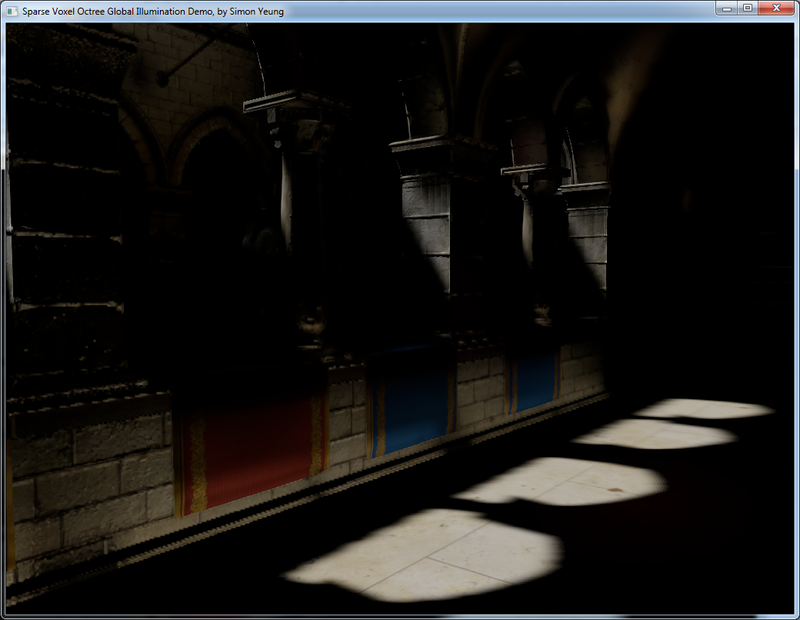 First, we render the shadow map from the light's point of view. 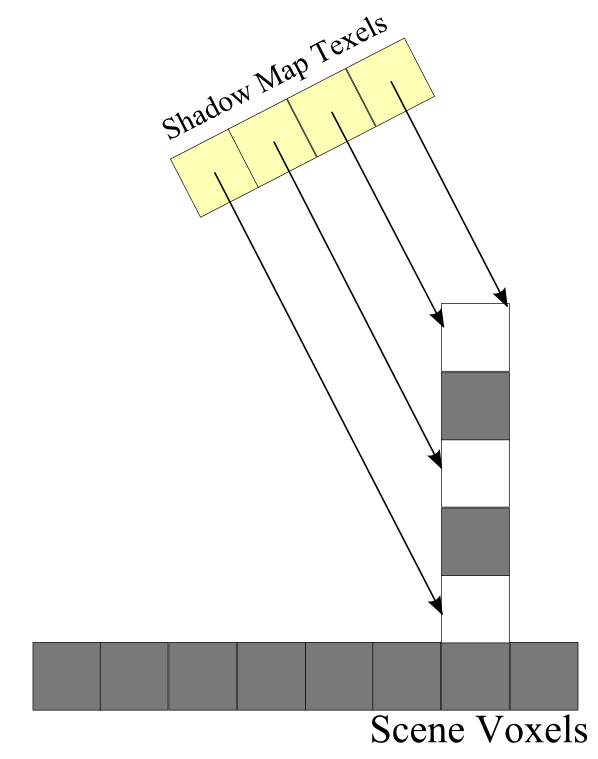 Then for each pixel of the shadow map, we can re-construct the world position of the shadow map texel and then traverse down the octree data structure to calculate the reflected radiance(assume reflected diffusely) and write it to the 3D texture bricks. 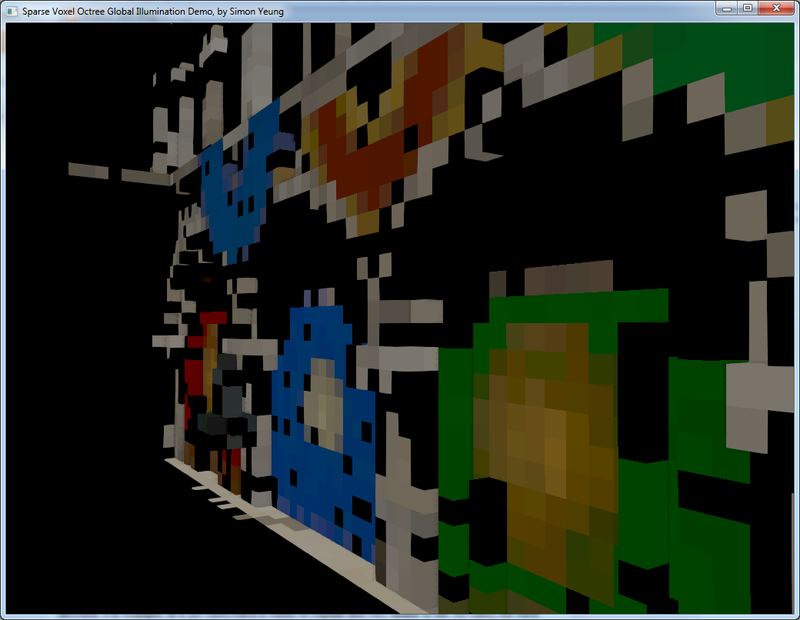 This artifact will also occur when the shadow map resolution is low. Consider the the figure below, we have a directional light injecting lighting to the scene (which have a wall and floor). As we launch one thread for each shadow map texel to determine which voxel get light injected, we can only inject light to 3 voxels(the white square in the figure) in the above case. 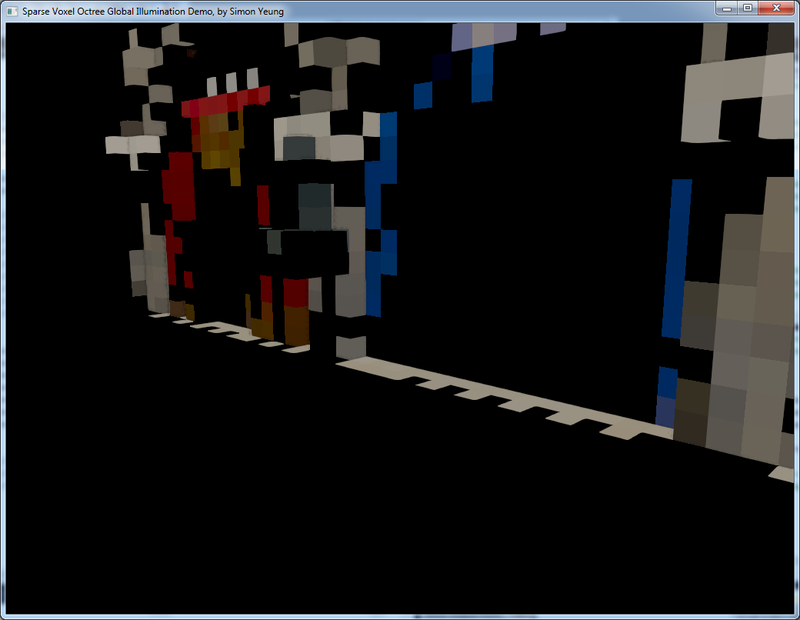 While if the shadow map resolution is high enough, those 5 vertical voxels should all be injected with light. in each group, we filter along the +X direction, for example in the upper left group, we first alpha blend the value in the +X direction and then average them to get the value for that group. After calculate the values for all the 4 groups, we can compute the filtered center voxel value by repeating the above steps for the 4 group values. But for the corner values(e.g. texel a, b, f, g) in a node tile we cannot access all the 9 texels to compute a filtered value as those values are in the neighbor node tile. 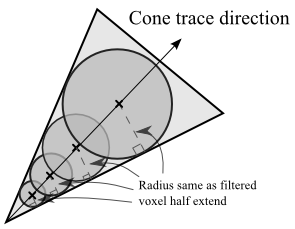 So the group value are partially computed and store in the 3D texture first, then we rely on the transfer step described in the cone tracing paper to complete the calculation. In other words, during the transfer steps, some of the filtered value is computed by first alpha blending the neighbor group values followed by averaging them, and other filtered value will be computed by averaging first followed by alpha blending. 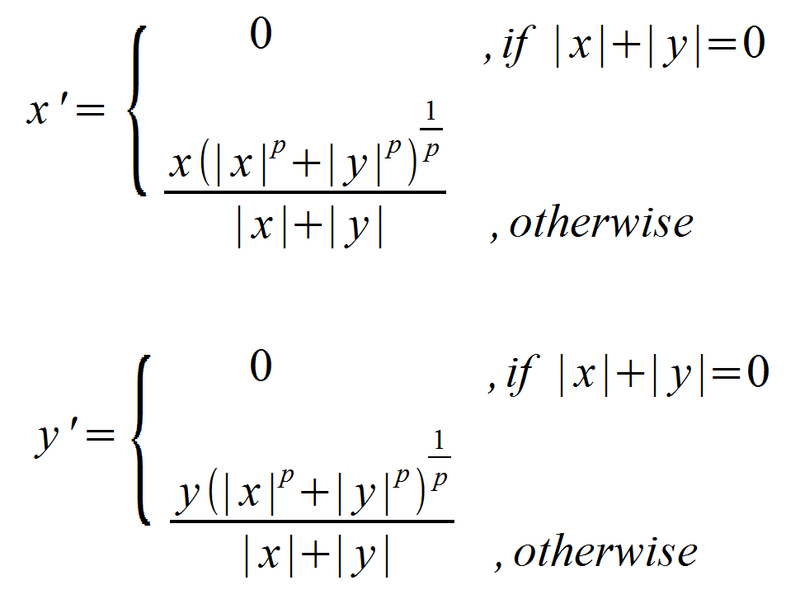 Although this calculation is not commutative, but this can reduce the number of dispatch passes to compute the filtered value with a similar result. which apply the alpha blending to only the direct lighting and the indirect AO is applied inside the shader. 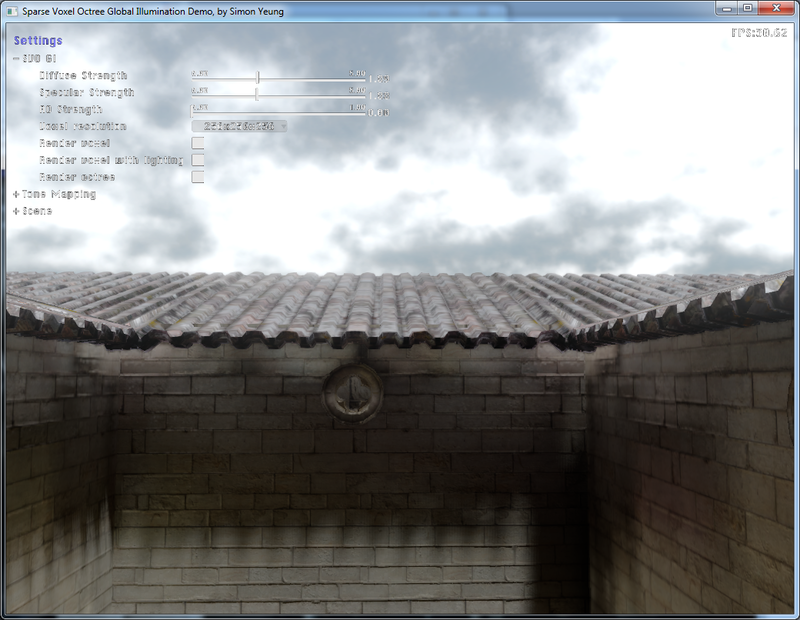 To make the indirect illumination calculation faster, 5 ways are used to speed up the calculation a bit. First, when the scene is initialized, the first 4 steps that described in the overview section are performed for all the static geometry. 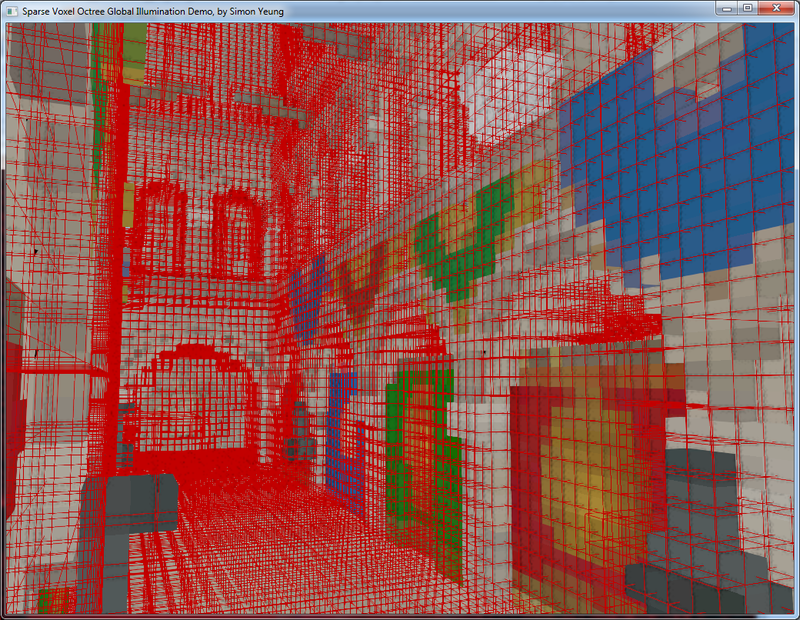 Then in every frame, we re-calculate all the 5 steps for voxels that affected by dynamic objects. 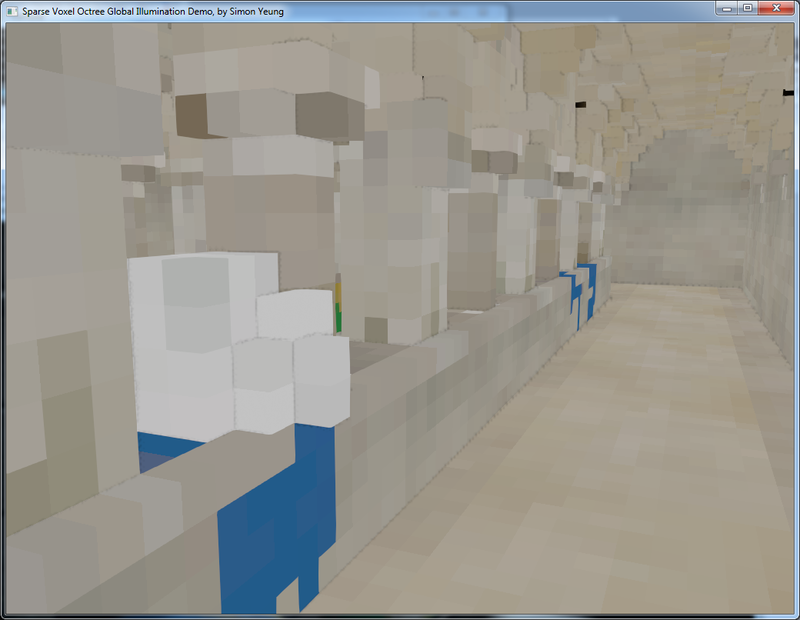 So, only dynamic objects will be voxelized every frame (while static voxels are already stored in the octree and we don't overwrite those data which can be identified by bit flag stored in the node). 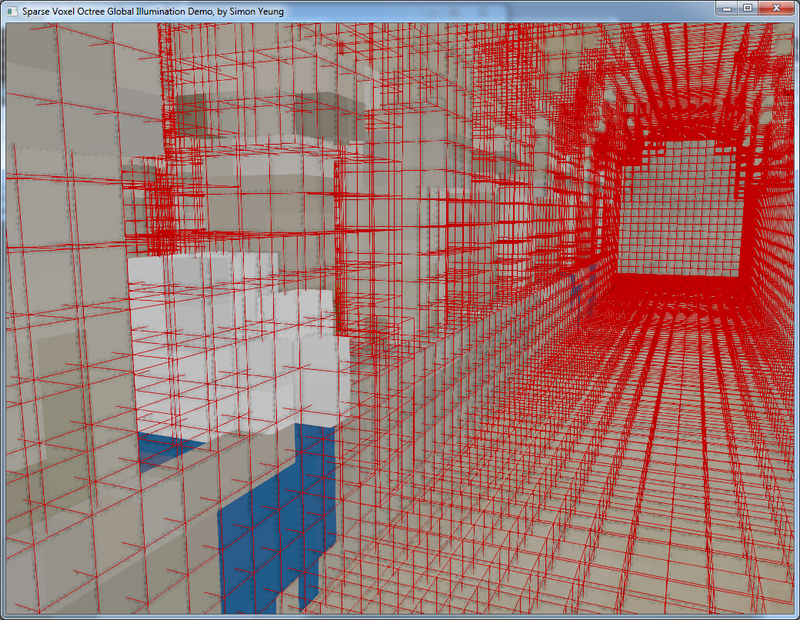 Those dynamic voxel fragments are appended to the end of the octree node buffer which can be cleared easily. Also, we need to reset the static octree node neighbor offset which points to dynamic nodes, and those static nodes that affected by dynamic voxels in previous and current frame need to re-filter again. 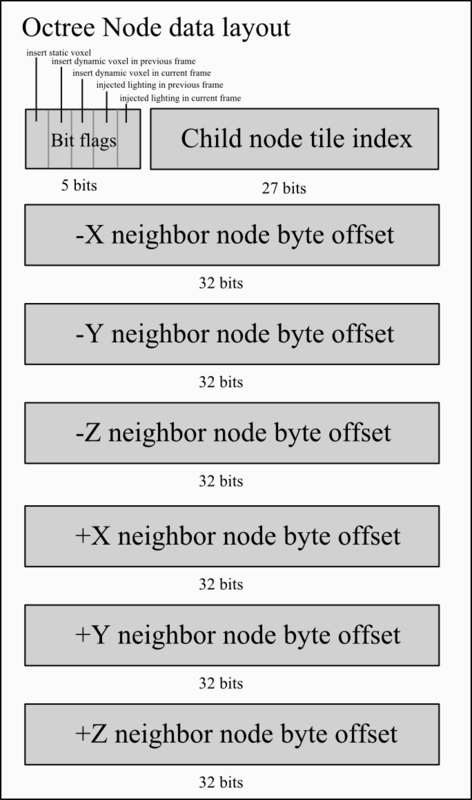 Those nodes are found by dispatching threads for all the nodes and queue those node index into another buffer. So only those with changed value will be re-calculated. 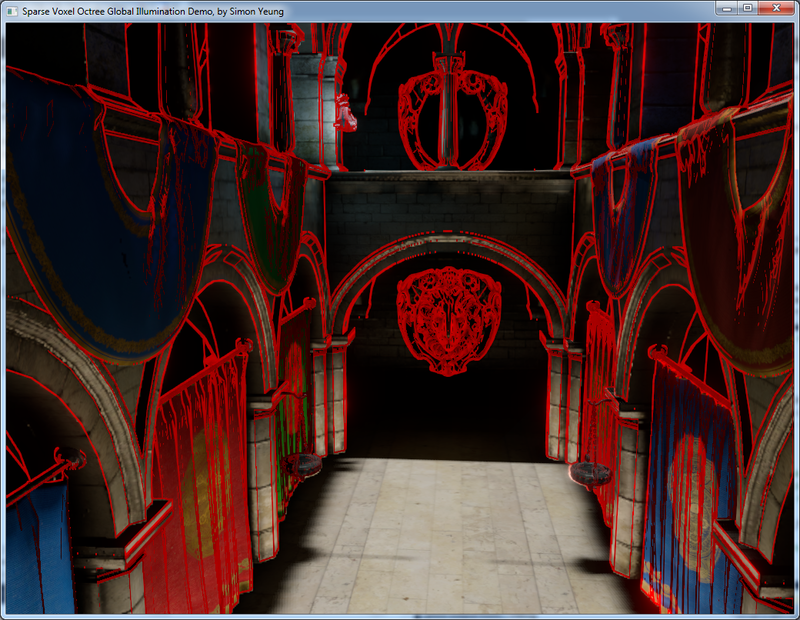 Reflect light using InterlockedMax() voxel normal. So I only use InterlockedMax() function for normal in the dynamic geometry and keeping the static geometry computing an average normal. That is why you can see the octree voxel data structure(in octree building pass section) store a 1 byte counter along with the normal but not other attributes. Third, I perform a view-frustum culling when injecting the direct lighting into the octree because there is no point to filter the light that is far from the camera where we never sample it from the current point of view. 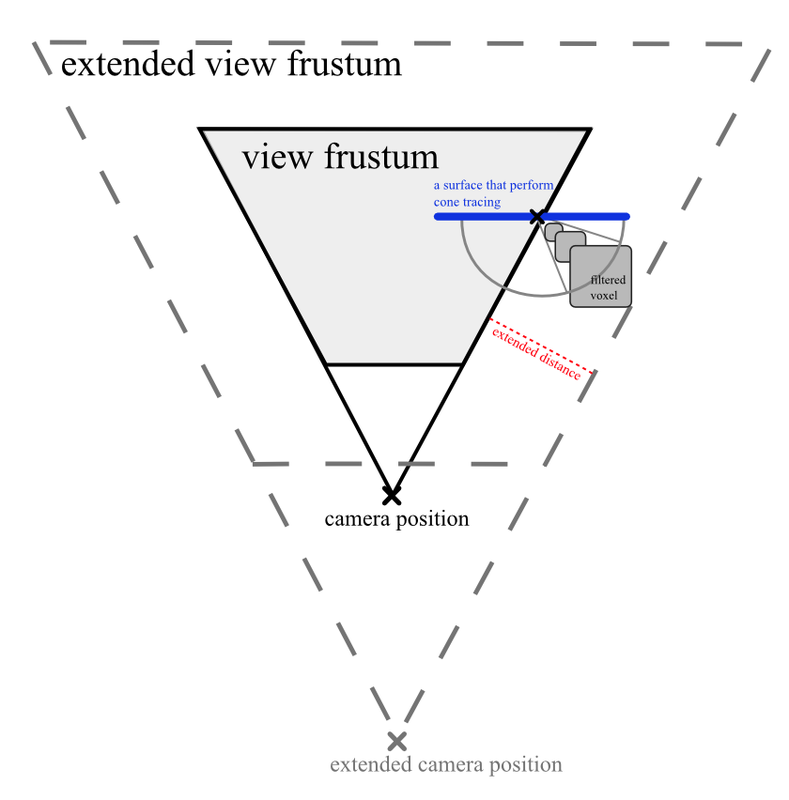 An extended frustum is calculated from the current camera (refer to the figure below) for culling. 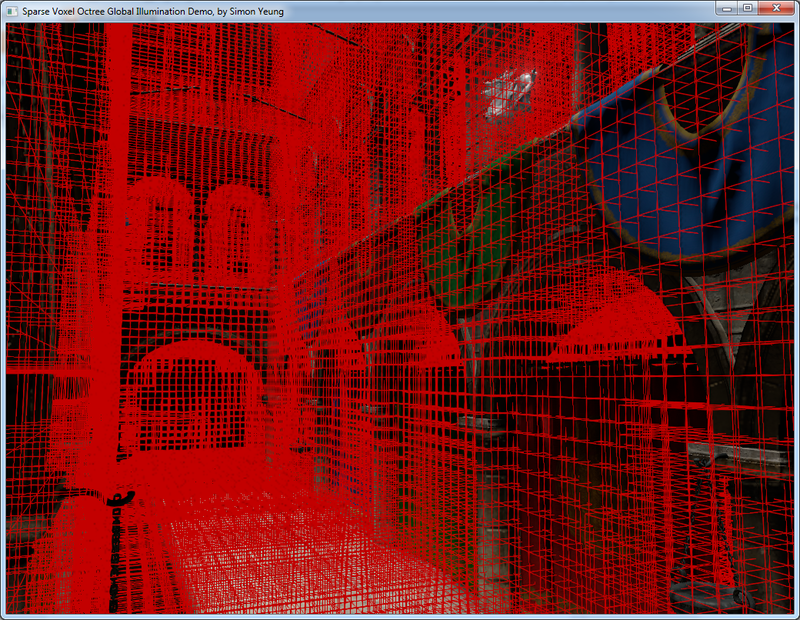 This frustum is simply moving the camera backward a bit with increased far plane using the same field of view. 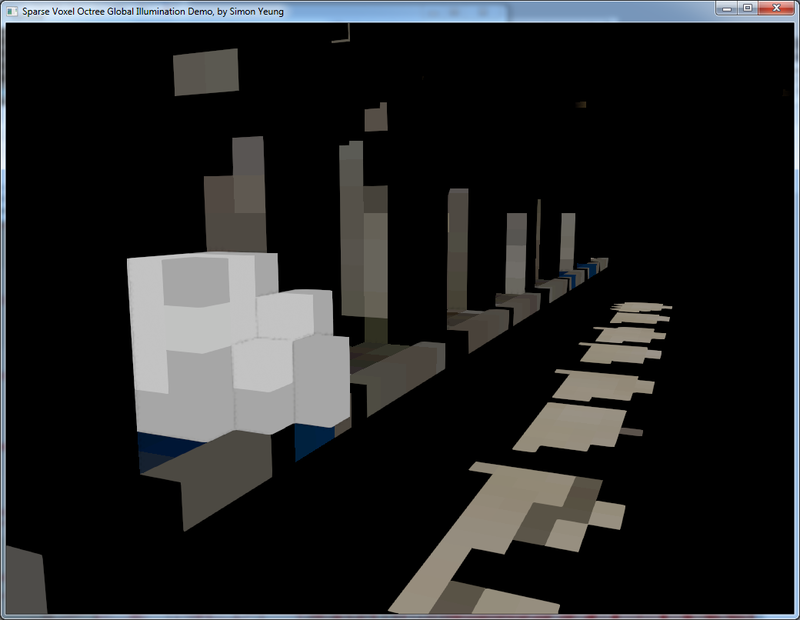 The extended distance is calculated by the maximum cone tracing distance (I limited the cone tracing distance in the demo, which lost the ability to sample from far objects like the sky) and the filtered voxel size. 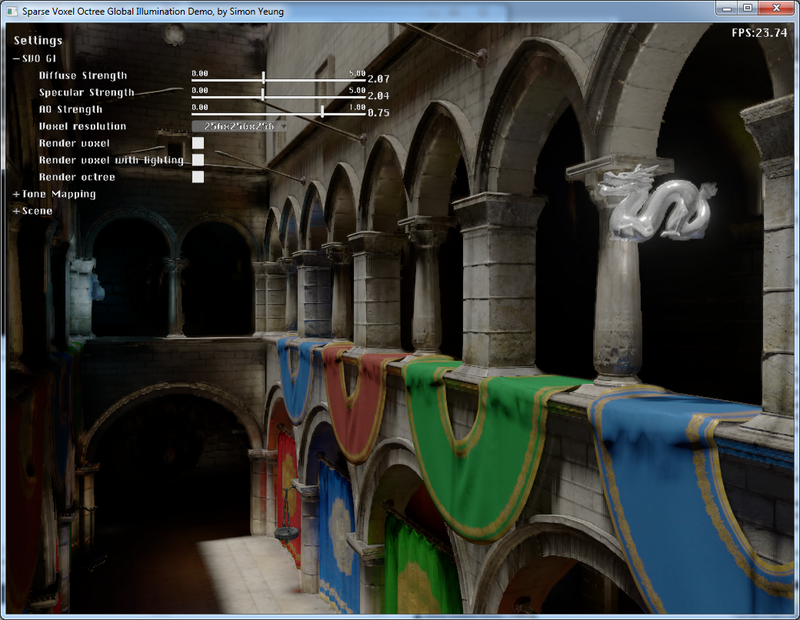 Fourthly, I perform the cone tracing pass at half resolution of the screen resolution. 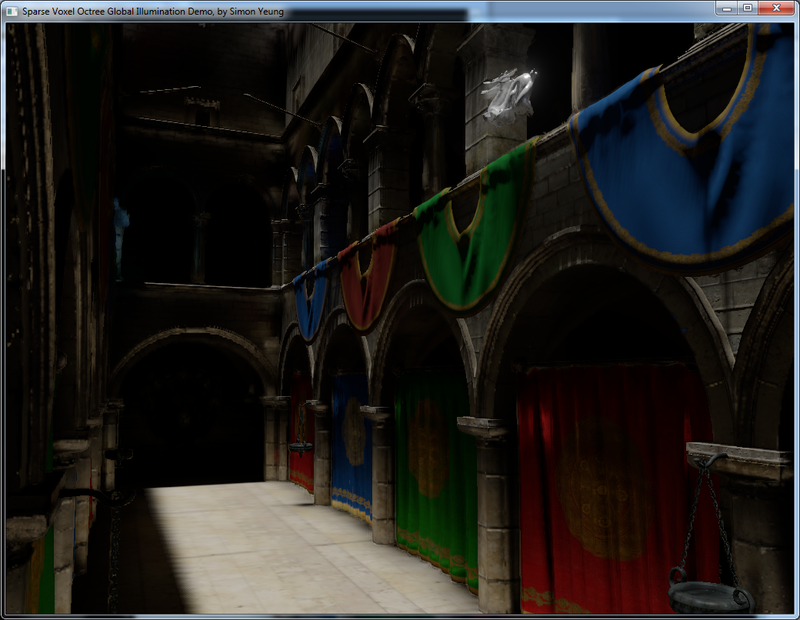 However, this result in visible artifact when up-scaling to full resolution especially at the edge of the geometry (the strength of the indirect lighting in the following screen shots are increased to show the artifact more clearly). 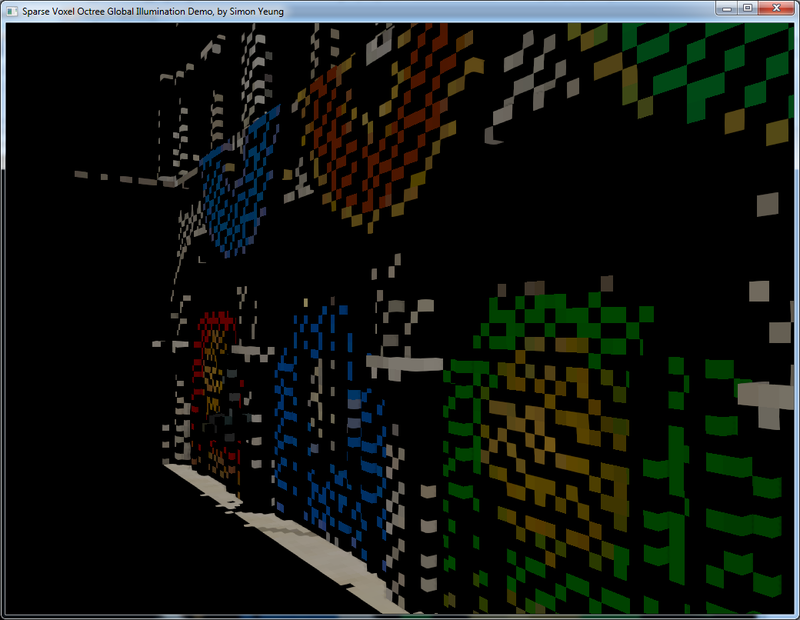 So, I first decided to just fix those pixels by finding them with an edge detection filter using depth buffer. 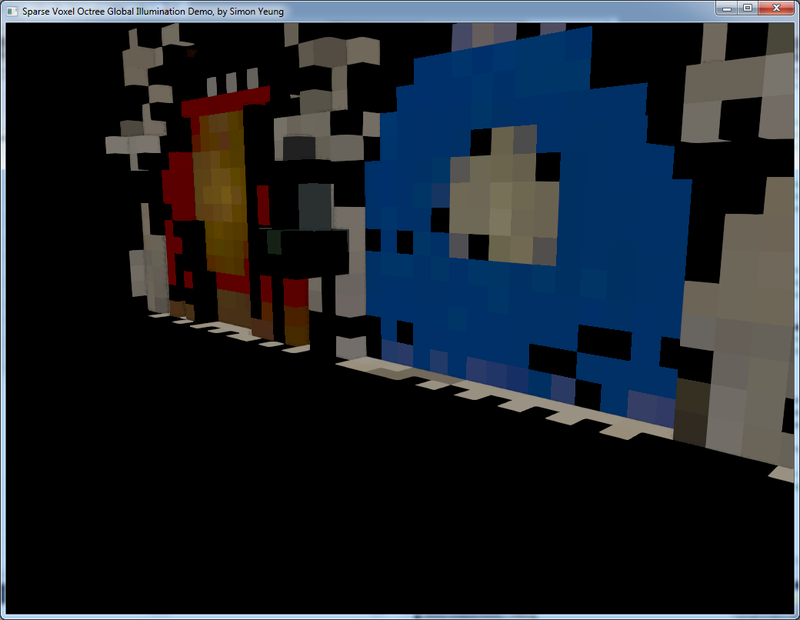 So, my second attempt is to just simply blur those pixels (averaging with the neighbor pixel). 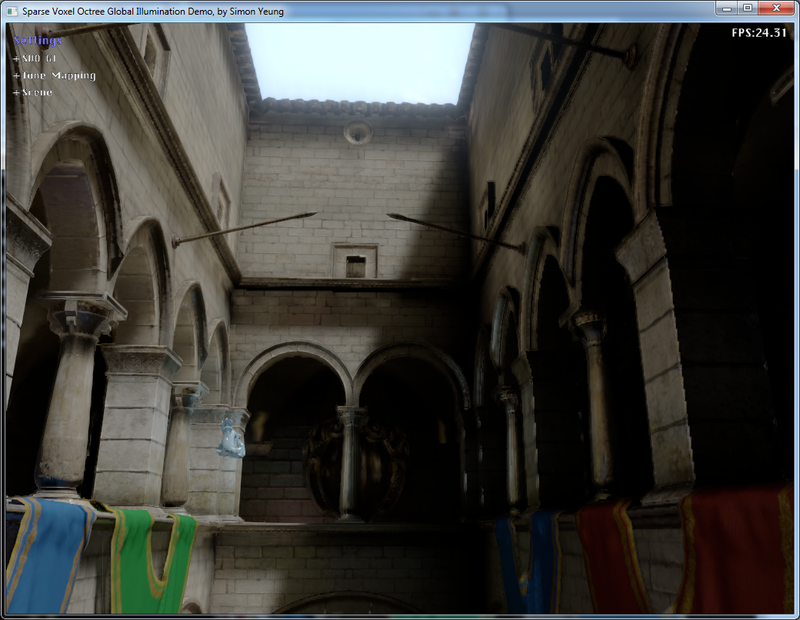 The quality of blurring is not as good as re-compute the cone tracing, but it is much faster. 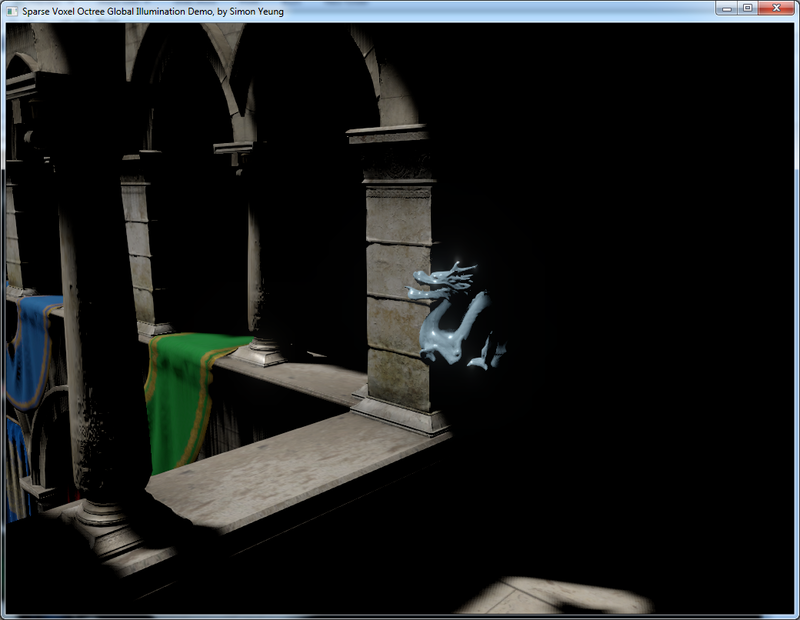 The advantage of voxel cone tracing is to compute the GI in real-time with both the dynamic lighting and geometry. 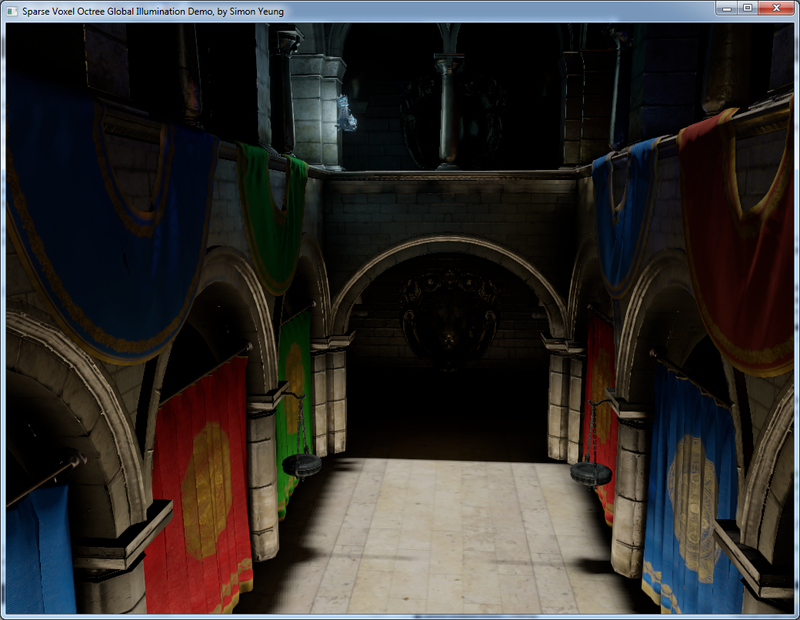 Also the specular indirect lighting gives a very nice glossy effect. However, it uses lots of the processing power/memory and quality of lighting is not as good as the baked solution. 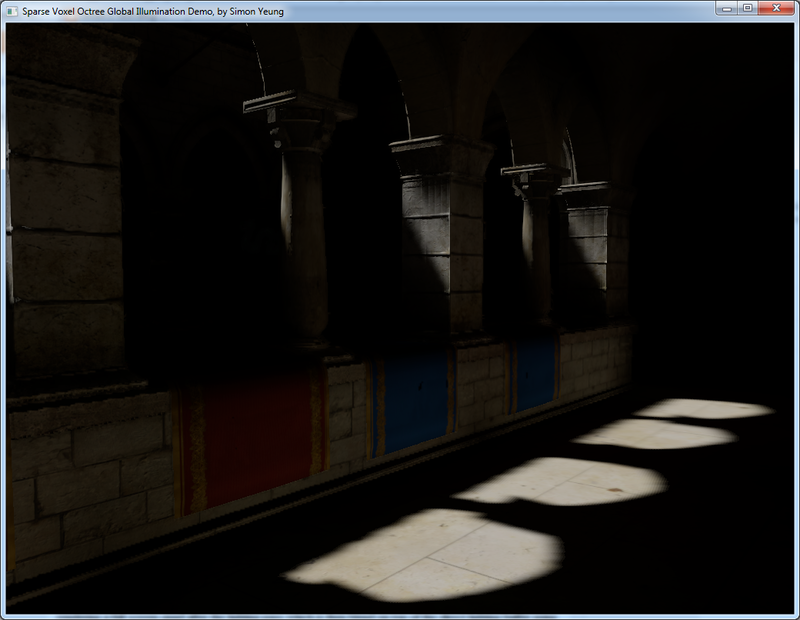 In my implementation, I can only use 1 directional light to compute single bounce indirect lighting. 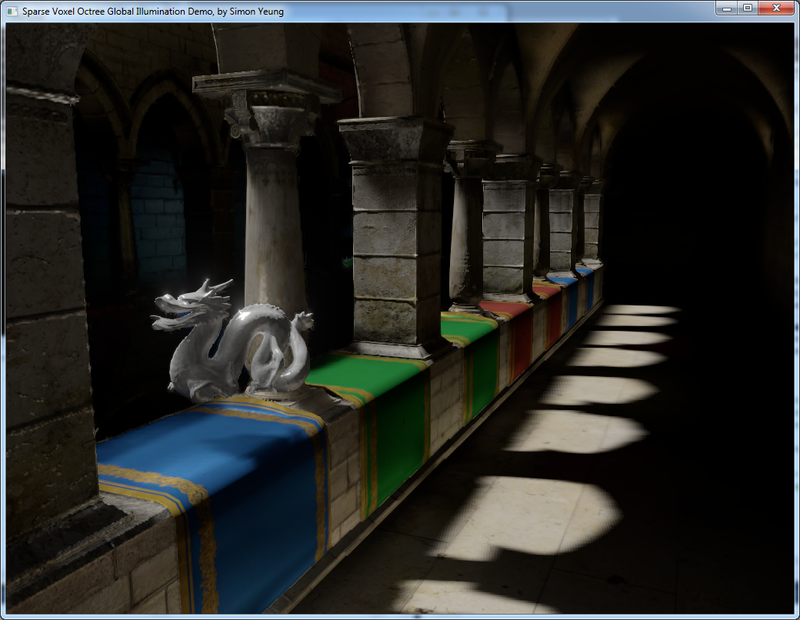 And there are still room to improve in my implementation as fewer cones can be used for tracing, using the depth buffer for view frustum culling, better up-sampling when performing cone tracing and divide the voxels into several regions to handle a larger scene like Unreal Engine does. But there is never enough time to implement all that stuff... 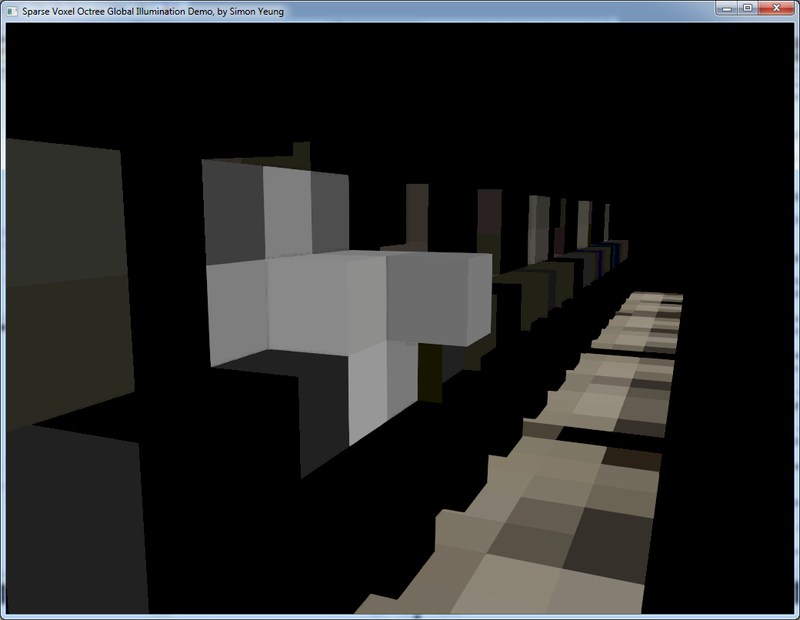 So I decided to release the demo at this stage first. 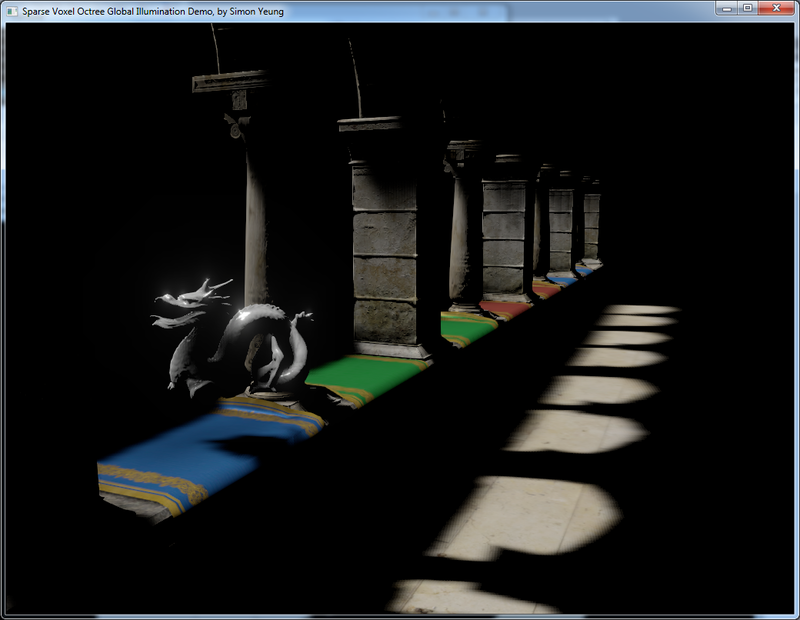 In the demo, I have added some simple interface (for changing stuffs like the light direction, indirect lighting strength) for you to play around with. Hope you all enjoy the demo. Finally, I would like to thanks Kevin Gadd and Luke Hutchinson for reviewing this article.